Kubo and the Two Strings is, in an almost paradoxical move, a self-consciously magical film. Much attention—almost too much attention—is directed on the part of the filmmakers towards the powers of stories, placing a storyteller at its center and ultimately using it to propel and shape the adventures to come. In less sincere hands, or ones more focused on making a film specifically about the wonders of cinema, this concept would seem forced or unjustified, but in the hands of Laika, it is only one part of the joy that forms this labor of love, a thrilling, heartbreaking, and warm journey that feels utterly transporting. The plot of Kubo and the Two Strings is purposefully mythic, framed (at least at the beginning) by the words that Kubo (a noble, perfectly young Art Parkinson), a young one-eyed boy living in feudal Japan with a magical skill of magically folding origami and a preternatural talent for his stringed shamisen, uses to begin his own stories. These stories, almost always following the same format of a great warrior named Hanzo and his quest, are revealed (in the first of many clever narrative choices) are revealed after the first telling to be handed down to him by his mother, who seems to only come to life when she tells said stories. It speaks to one of the most important ideas, that of inheritance and family, that permeates the film, and many echoes of Kubo’s parents (one of whom is Hanzo) show up in Kubo, sometimes commented on, sometimes not. Eventually, as is inevitable, Kubo embarks on his quest, with only his origami, shamisen, and a wooden charm reincarnated by magic into Monkey (Charlize Theron, almost overflowing with warmth and sharp wit). In a particularly effective stroke, the filmmakers makes the goal of the quest the three pieces of magic armor already introduced in Kubo’s origami story while mixing in a very real abundance of unknowns; the glamours and heroics of adventure are swamped by the dangers and the threats. 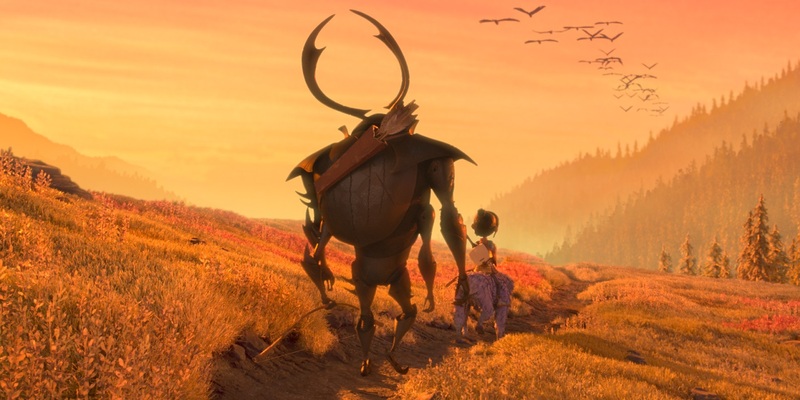 Here is where the most beautiful parts of Kubo and the Two Strings arise: the simple interactions of Monkey and Kubo and, a short time later, Beetle, a samurai trapped in a giant beetle-like shell (played by a beautifully dim-witted but stalwart Matthew McConaughey) are a joy to watch as their bond only strengthens. There are, thankfully, no conflicts between the trio—despite their temperamental differences, they all recognize the goal and work together with a great deal of composure; at least, as much as can be expected from such a motley group. Kubo and the Two Strings is, of course, absolutely dazzling, utilizing a blend of 3-D stop-motion and CGI to craft an immersive world filled with caverns, endless oceans, and monsters of all types—each has their own allure, and all are immaculately detailed, just removed enough from a life-like look to be fantastical. Such a smooth look is understandably cause for mild concern, and perhaps adds fuel to the criticism that the plot is akin to that of a adventure video game, but the emphasis is placed equally on the action and the characters, as evidenced by a thrilling second-act battle between Monkey and one of the villainous Sisters (both voiced by a chilling, mocking Rooney Mara) that is upstaged by a stunning, absolutely heartbreaking tale told by Monkey, animated by Kubo’s origami. Kubo and the Two Strings might go slightly too far in resolving every last one of the mysteries inherent to the plot, and the ending might be too tidy and literal, but Laika never lets the magic get lost, and they remain resolute in crafting a gorgeous, moving, and genuine film that maintains its belief, without a scrap of doubt, in the power of stories.